I first fell in love with Knuffle Bunny back in 2005, when book one - A Cautionary Tale - stole my heart (and that of my kids). The story of young Trixie and her prone-to-be-lost toy rabbit certainly rang bells with parents everywhere... and in fact, I can still remember the terror, as a young tot myself, when my beloved pink teddy bear was lost forever - thrown one too many times from a retro 60s pram whilst out shopping with Mum. I've found my own children's beloved toys in endless bizarre locations - and have shared the exact same expression as Trixie's harried dad (oh, how I wish I could have remained as cool as Trixie's unflappable mum!). 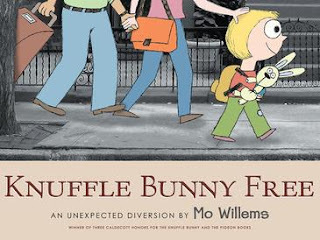 Willems has certainly pinpointed the dichotomy between some parenting partners (the cool one, the harried one) with his Knuffle Bunny books - all done with trademark hilarity and super-cute cartoons, superimposed over black and white photographs. In book 'free' - An Unexpected Diversion - Trixie travels to Holland to visit Oma and Opa - and of course, you can imagine what she leaves on the plane. The part where she reveals this to her dad is priceless. But Oma and Opa try to convince Trixie that she's a big girl now - and sometimes it's important to let things go. So, Trixie tries really hard, and she actually does okay, but it's not until Trixie returns to that same aeroplane for her trip home, that she realises just how far she's come - and just how 'big' she might be. But I'm still holding hope Willems finds another Knuffle story in him yet. Clever, visually rewarding, funny-bone-tickling and heart-warming all at the same time - Knuffle Bunny is, and always will be, Willems at his very best.